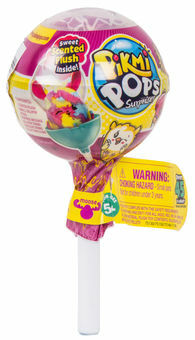 It's not a lollipop, it's a Pikmi Pops! Unwrap a Pikmi Pops to find cute surprises inside! Display your Pikmi plushie inside the lollipop or use the dangler string to hang your favorite Pikmi on your favorite bag, keys, phone, spiral note book, pencil case and more! There are over 45+ super cute mini Pikmi plushies to collect, in 12 yummy scents. Don't pick one, pick a lot - and unwrap the surprises in your Pikmi Pops!